Warrior King, the Rootz Warrior returns to Austin, Texas and the historic Flamingo Cantina, backed by Austin & San Antonio based Roots Reggae Outfit Lakandon, formerly the DUB Gideon band. Also on the bill are Houston’s Roots From The Clay and DJ Jah Bill. The night promises to be a powerful evening with the legendary Warrior King, the Rootz Warrior, known for always bringing a high energy, and unique stage show to his fans worldwide in praise the King of Kings. A keeper of the torch of authentic Roots Reggae music and the owner of scores of massive global reggae hits that are sealed as anthems, Warrior King has blazed a trail throughout the world over the last 5 years, re-establishing himslef as one of the true soldiers in RastafarI, maintaining the purity of authentic Reggae music with consistently potent material that never waivers from the message of Rastafari. 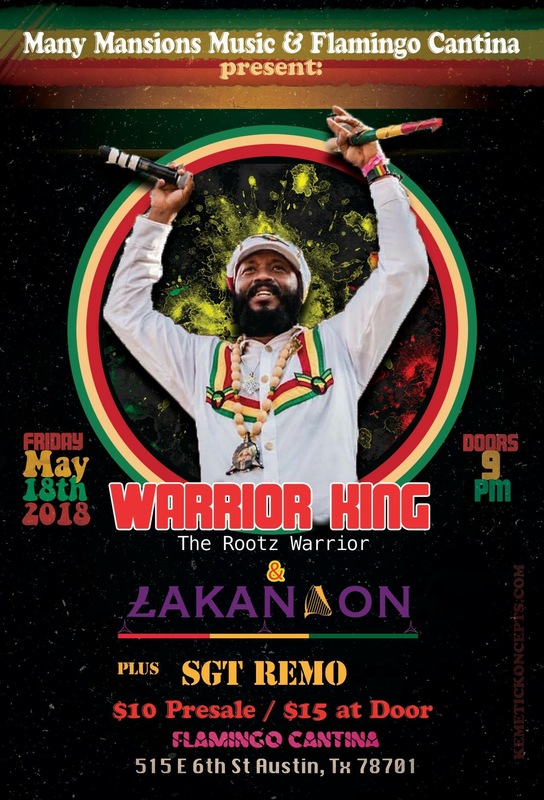 Lakandon, formerly the Dub Gideon band, firmly established as pioneers in the resurgence of Texas Reggae music over the last 8 years as a solid unit livicated to foundation RastafarI Roots Reggae Music, will have the honors of presenting Warrior King’s music for the evening. Winston’s Kitchen will be on hand with delicious Caribbean fare offerings.